Traveling Posters: In 1995, this set of traveling posters was designed to commemorate the 100th anniversary of the foundation of the St. Louis Province. 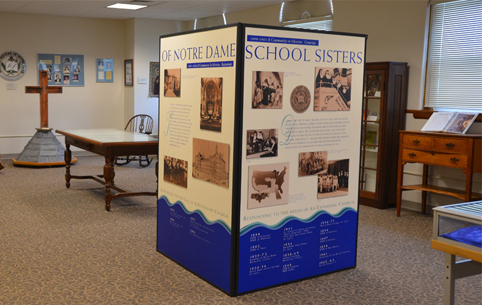 The posters depict historical photos and dates related to the history of the School Sisters of Notre Dame in St. Louis and throughout the province. With the purchase of the Grand View Estate in 1894, the beautiful grounds on the banks of the Mississippi River now known as Sancta Maria in Ripa, became home to the St. Louis Province (now part of the Central Pacific Province). In 1895, the third motherhouse in North America was built there, fulfilling the deathbed request of Mother Caroline Friess. This historic building was renovated beginning in 2000 with its north and south wings becoming what is known as the Theresa Center. A space on the first floor was designated as the new home to the Heritage Room of the then St. Louis Province. There, within its walls, the history of the province speaks to visitors. The hanging banners of Blessed Theresa Gerhardinger, foundress of the School Sisters of Notre Dame, and Mother Caroline adorn the walls. These commemorative banners were made in 1995 in celebration of the 100th anniversary of the St. Louis Province. Line drawings of Blessed Theresa, Mother Caroline, the world and the motherhouse, designed by the SSND Liturgical Arts Department, are showcased there. The drawings are sketched with the names of all of the sisters who entered by 1995. During her visit to the St. Louis Province in March 1933, Mother Almeda Schricker, general superior (1928-1955), presented the German sculpted crucifix as a gift to the St. Louis Province to commemorate the centenary of the SSND foundation and the Golden Jubilee of Mother Jolendis Bachmann, St. Louis provincial (1924-1935). The unique crucifix has rays emanating from the head of Christ, grapes at the hands and feet, and a chalice at the feet of the crucifix. The rays symbolize Christ’s resurrected glory; the grapes and chalice the gift of the Eucharist.